Muscle builders often follow a high protein diet plan. A high protein low carb diet is efficient at burning fat and building muscle. Our bodies burn carbs for energy. Any carbs we don’t need for energy get converted to fat and stored in the body. If your body does not get carbs, it will use stored fat for energy. One of the high protein diet side effects is putting the body in a state of ketosis. Ketosis can be harmful for people with certain medical conditions like diabetes, kidney disease, and coronary disease so they should not adopt this diet. Our bodies are designed to use protein, fats and carbohydrates. A totally no carb diet will lead to health problems. Muscle builders who adopt a high protein diet plan will include some complex carbs in their meals, especially before a strenuous workout. After the work out, the muscles have been stressed and slightly torn. The repair of the muscles is what causes them to grow and develop. Since muscles are made of protein, muscle builders will eat 30 grams of protein at each meal and 45-50 grams at the meal immediately following the work out. Even though this is a high protein diet plan, some complex carbs and good fats should be included in each meal. 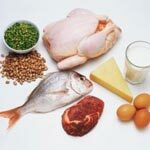 If you are just starting a high protein diet plan you are probably wondering what to eat on a high protein diet. Beef is very high in protein with 42 grams in a six ounce steak. Tuna is next with 6 ounces providing 40 grams of protein. Chicken meat and pork come in around upper 20’s for grams of protein. Fish averages 22 grams per 3.5 ounce serving and a half cup of tofu has 20 grams. Cottage cheese has 15 grams of protein per half cup. Always check with your medical provider before adopting a diet plan that restricts certain nutrients and focuses on others.